Itchmo: News For Dogs & Cats » Blog Archive » Just Five More Minutes And Then I’ll Get Up! Just Five More Minutes And Then I’ll Get Up! This entry was posted on Sunday, June 10th, 2007 at 3:55 am	and is filed under Funny Cats & Dogs, Cats, National Dog, Cat & Pet Info. You can follow any responses to this entry through the RSS 2.0 feed. Both comments and pings are currently closed. What a beeeeautiful cat! I love her little choco-paws and pinky, creamy, white belly. She should stay in bed as long as she wants! After all, why prowl when one can lounge? Such a sweet little baby! Can I keep her, Mom? I can’t stop looking at this kitty. I love this picture and I’m half in love with the cat — and I’m “Pit Bull Lover”! Haha. Thank for the nice comments. 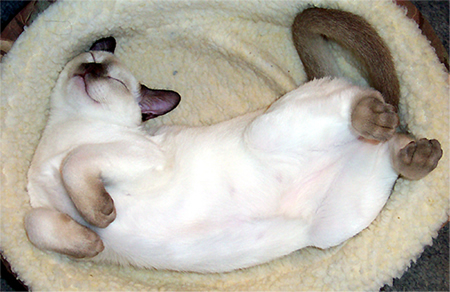 It’s a Male Tonkinese Champagne Point from Celestial Pets. He’s is the son to Coconut who is a Champagne Mink Male. Other pics can be seen at my photo gallery if you like. I love taking pictures and these are some of my favorites. that belly wants me to give it a tiny poke and tickle. not only do they generaly look so damn cool all the time but they relax like no other creature. Matrix is gorgeous! It’s such a perfect photo it looks almost like a painting. Kevin I knew he looked a lot like my Cairo, who is a Champagne Mink male. He is beautiful! If your referring to the ones on my photo gallery they are Bengal cats. My brother and his girl friend breed them.